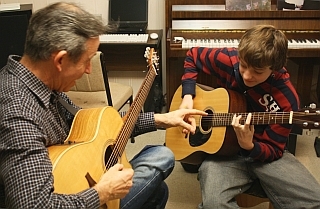 The following people (Wayne Robinson and Bernard Wells) provide tuition for bluegrass and old-time instrument styles. I have been playing bluegrass banjo since age of sixteen and clawhammer for about twenty years. I have recorded in studios for albums as well as TV and radio jingles. 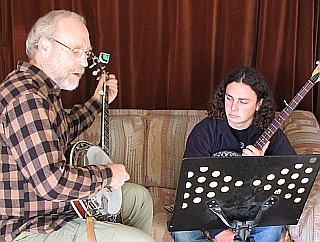 I have taught banjo for the last twenty five years. I’ve authored a self teach bluegrass banjo book, which is for sale. The book contains thirty two step by step exercises, beginning from very basic picking patterns through various banjo playing techniques, leading up to complete but simple tunes towards the end. All notation is written in easy to read tablature. The book comes with a companion CD which includes all exercises in the book, played first slowed down then at a reasonable tempo. Over the last 40 years I have developed my acoustic guitar skills from finger style folk to jazz and flatpicking bluegrass & old timey styles. I’ve been playing mandolin for eighteen years and have recently been learning fiddle. I studied music theory and teaching as part of my five year music diplomas (in recorder). Ballyscully, Chilli Jam, Dargaville , Baby Boomer Girl and with viola player Peter Daly.